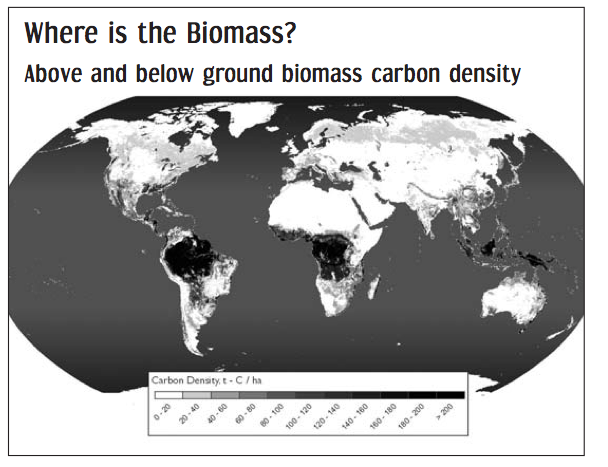 86% of the world's biomass is located in the global South. While from space the planet may look green and rich with biomass, the dirty little secret of the biomass economy is that – just like fossilized carbon reserves (oil, coal, natural gas) – the living carbon reserves are not equally distributed. Worldwide, land-based vegetation stores an estimated 500 billion tonnes of carbon. However 86% of that (430 billion tonnes) is stored in the tropics and sub-tropics, while boreal and temperate eco-regions store only 34 billion tonnes and 33 billion tonnes, respectively. The tropics are also where biomass replenishes the quickest and where marine biomass, principally phytoplankton, is most productive. Not coincidentally, these areas of the planet where biomass is already most concentrated are now attracting the interest of companies wanting to produce biofuels, biobased chemicals and bioelectricity. Brazil in particular has witnessed a massive increase in bioeconomy-driven investment. Indeed, the World Economic Forum has suggested that “a new international division of labour in agriculture is likely to emerge” between biomass-producing tropical countries and Northern countries – although what is so new about this division of labour is unclear. “As we looked at the world and looked at where the lowest cost, largest scale biomass was, we found that Brazil really was the Saudi Arabia of renewables.” – John Melo, CEO of Amyris Biotechnologies Inc.